This summer a team of Kāpiti Coast creatives launched an interactive multimedia project aimed at positive action around climate change and the overuse of plastic in our society. Leading the team is award-winning playwright Rachel Callinan, with theatre stalwart Julia Truscott, artist Kaia Hawkins and renowned producer Zelda Edwards. Supported by a Waste Reduction Grant from Kāpiti Coast District Council, ‘Shipshow’ is a multi-faceted venture starting with several fun beach clean-ups where people are encouraged to come dressed as a pirate and will be asked to search for plastic ‘treasure’ which will be used to repair and decorate a mysterious boat which has appeared on Paekākāriki beach. The treasure will then be crafted by youth participating in a holiday programme to get the ship ready for a public launch on February 4th. The night the ‘boat’ sets sail will be one of the most anticipated events of the summer with performances from local musicians, a kapa haka roopu, samba dancers, actors, poets and hosted by the magical crew of eco-pirates who will be sailing the ship through the night. Local performers of all ages have rehearsed for the event - a positive coming together of creative energies on the coast who are exploring ideas for better ways we can live together on our planet. The team put the call out for any interested groups or individuals keen to perform at the ‘mini-eco-festival’. With performances being anything from a demonstration, a speech or a song inspired by the artists’ own response to our current world situation. 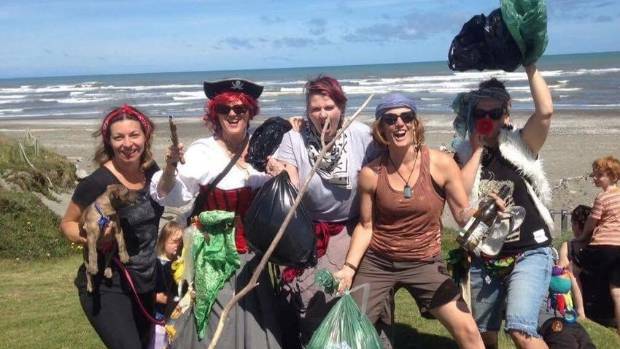 The pirates have attracted the media, Stuff reported 'shiploads of Kāpiti residents are cleaning the districts beaches' . When interviewed Julia Truscott explaining that on the evening of the 4th the audience will be taken on an adventure by the mysterious bunch of eco-pirates who have put the call out to clean the boat. The story is based on the organising quartet's research on climate change and their realisation that the situation is dire 'but it doesn't seem like anybody is talking about it very much'. She said beachfront properties and extreme weather events meant the issue was likely to affect Kāpiti in the next 50 years. "We wanted to [talk about Climate Change] in positive way, not doom and gloom, celebrating the strength of the community and the notion that we are all in the same boat". The crew have also provided a moment to consider the global impact of these issues by screening the film "This Changes Everything by Naomi Klein" at Paekākāriki's St Peter's Hall on January 29th. Aptly the Show's catch phrase is 'he waka eke noa' or 'we are all in this together'. The huge scope of the project combining beach clean-ups, a recycled art holiday programme, film screening and then the grand performance certainly shows these pirates are committed to their cause.